Our Guest writer this month is Jackie Heyen, aka Patches. She lives a life many of us only dream of. 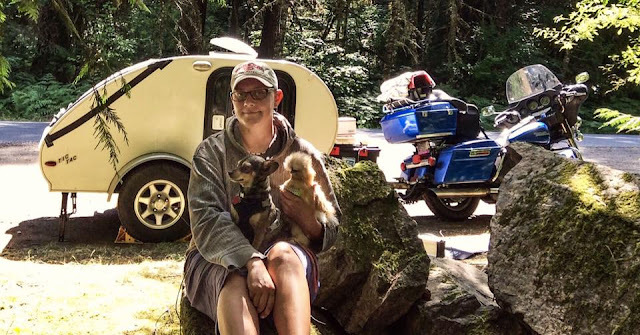 Living on the road on her Harley Davidson Motorcycle named Blue. Towing a small teardrop trailer, that she calls TicTac. Even better, she travels with her dog, Yoska, and her chicken, (yes a chicken!) Esmeralda. She lives seeing the sights that many of us only get to see on vacation. She also is a huge proponent of being environmentally friendly and sustainable. Check out her blog at www.Patreon.com/BlueRoad to get to know more about this amazing motorcycle riding woman! Now to let her tell you of this Amazing Ride in the Alabama Hills of California. Last spring before the bustle of Labor Day and summer vacations I rode north on highway 395 through the Eastern Sierras. It was a wet winter with rain that made the desert bloom, the mountain peaks white with snow, and the rivers raging. I had many friends suggest I ride highway 395 and told me of all there was to see. 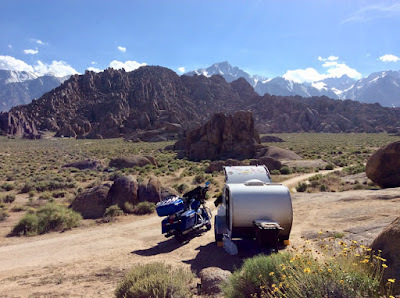 One of the places on my list was to stay a few days at Alabama Hills. Just outside Lone Pine, California is BLM land that has a fantastic view of Mt. Whitney and a history in TV and movies. The first stop was at the Lone Pine Film History Museum. Only a few bucks to get in and full of movie and TV history of the area. From Death Valley and filming of Star Wars to Hopalong Cassidy, Tremors, Iron Man, Gene Autry, The Lone Ranger and Bonanza, to name a few that were filmed in Alabama Hills. Head west out of Lone Pine just couple miles and you have a large area of BLM for camping, OHV, horse trails, hikes and spectacular views of the Sierra Nevada. There is a trail that goes by multiple natural arches and you can camp with no amenities for up to 14 days. I spent a week camping at Alabama Hills. Beautiful sunny days, then a day where a storm came thru and left even more snow on the mountains and surrounded us with dark clouds. With Mt. Whitney right in front of me, the clouds surrounded us, but never came over us. I sat and watched the storm dry and warm as it passed by. One night, I woke up in the middle of a full moon and stepped outside to see the moon shimmer off the snowy peaks. Truly the most beautiful area I have camped in my five years living on the road. In the week I was there I only got a small glimpse of this areas trails and roads. Many areas were camped in but it still felt like I was camping alone. The next camp would be at least a half mile or more away. Which was a bit frustrating while attaching my trailer, when I dumped my bike due to uneven ground. Luckily some tourists were driving to the natural arch trail and helped me get her back up. I was sad to leave, but I was out of supplies and there was more to see on highway 395. We were off to our next adventure, headed north to meet up with a friend for hot springs, camping, hiking and back road riding.